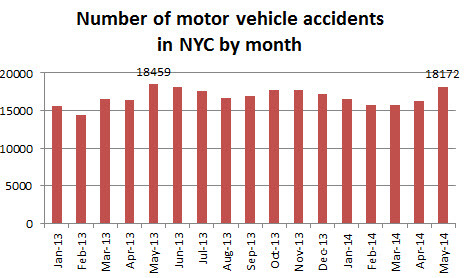 25 people died in vehicle accidents last May in NYC. 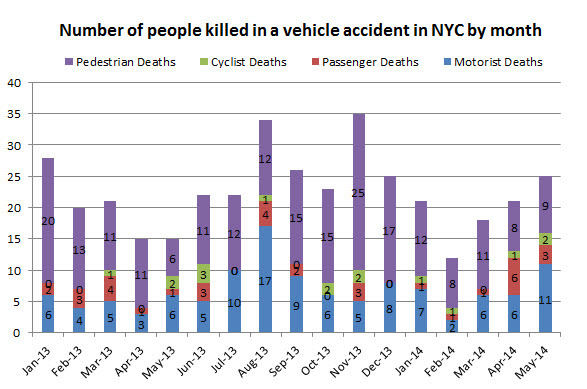 Among them were 9 pedestrians, 2 cyclists, 3 vehicle passengers and 11 motorists.This is the highest number of people killed during the length of a month on New York City roads since the beginning of the year. Last April 21 people died in vehicle accidents and during the same month a year earlier, 15 people were killed in traffic accidents. When looking at the numbers since the beginning of the year, the total number of people killed on the road in the city since the beginning of the year is 97 compared to 99 for the same period of 2013. 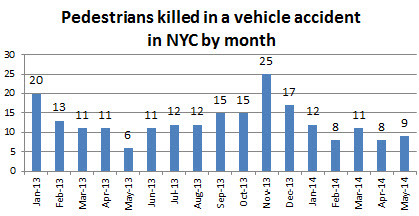 The number of pedestrian deaths was 9 during the month of May compared to 8 last April and 6 in May 2013. Since the beginning of the year 48 pedestrians lost their life in a traffic accident compared to 61 for the first 5 months of 2014, a decrease of 21%. 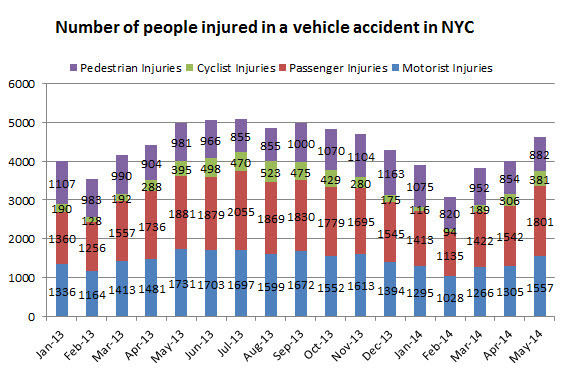 The number of cyclist deaths in May 2014 was stable at 2 compared to May 2013 and higher than last April, a month during which one cyclist died. The total number of cyclists who died in a traffic accident since the beginning of 2014 is 5 compared to 3 for the first five months of 2013. The total number of motor vehicle accidents for the month of May was 18,172 which is the highest number of monthly accidents for the last 12 months. In May 2013, this number was of 18,459. The total number of collisions since the beginning of this year is of 82,513 compared to 81,309 during the same period of 2013. 4621 people suffered personal injury after being involved in a traffic collision last May compared to 4007 in April and 4988 in May 2013. Since the beginning of 2014, a total of 19,433 people suffered personal injury related to a traffic collision. Among them there were 6451 motorists, 7313 vehicle passengers, 1086 cyclists and 4583 pedestrians. In the same period in 2013, the total number of people injured in a vehicle accident was of 21,073 with 7125 motorists, 7790 passengers, 1193 cyclists and 4965 pedestrians. 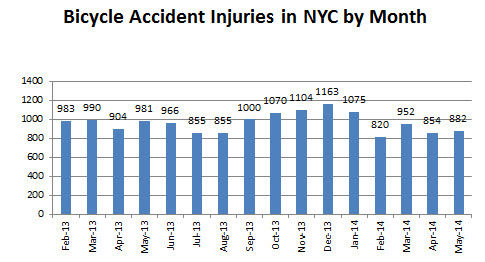 The number of people injured in bicycle accidents was 882 in May 2014 compared to 854 in April and 981 in May 2013. For the first five months of the year the umber of bicycle accidents injuries is down by 107 compared to the first five months of 2013, a decrease of 9%. 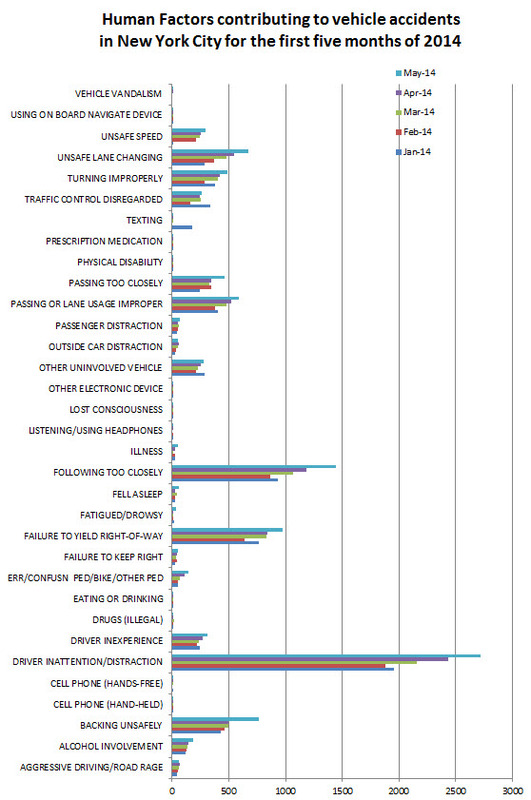 “Distracted driving” continues to be the number one factor in vehicle accidents in NYC followed by “following too closely” and “Failure to Yield right of way”.